50 Cent has SERIOUSLY upgraded his personal security team ... 'cause one of the guys watching his back is UFC Hall of Famer (and ex-WWE superstar) Ken Shamrock!!!! 49-year-old Shamrock was spotted on the rapper's personal protection detail at the CES convection in Las Vegas yesterday ... and afterward, Ken confirmed he's now working for a company that does private security for several "high-end clients," including Fiddy. After the convention, Ken tweeted that it was a "pleasure" working for 50 ... and said the rapper is, "By far one of the classiest gents I have ever worked with." As for Ken's fighting career -- he may not have given up on the ring entirely ... just last month, he appeared in a wrestling event in Costa Rica. But for now, don't screw with Mr. Cent ... or you might end up in a nasty ankle lock. 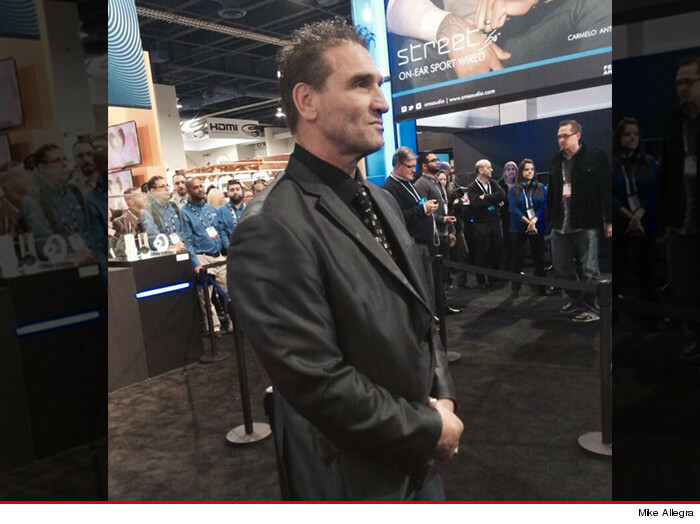 Re: Ken Shamrock, security guard. well, at least he's enjoying himself. But really, outside of novelty, why would you hire Shamrock as a bodyguard? You all know I'm a big fan of his, but its very strange.